A modern take on a classic urn profile, this clear crystal table lamp is paired with a tapered rectangular shade. Clear material exposes the wiring for a visually striking effect in this crystal urn table lamp. 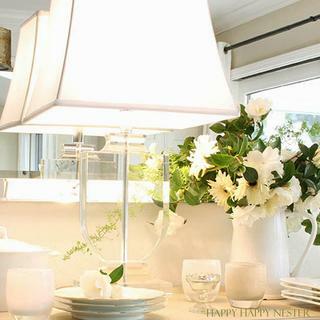 Paired with a tapered rectangular lamp shade in a neutral shade that will complement a variety of decor. 26 1/4" high overall. Rectangular base is 7 1/8" wide x 4 3/8" deep. Shade is 11" wide, 8" deep at the top x 15" wide, 11 1/2" deep at the bottom x 10 3/4" on the slant. 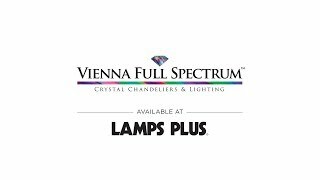 Crystal urn table lamp by Vienna Full Spectrum™. Crystal glass body with a footed, pedestal base. Tapered rectangular white lamp shade. 8-foot clear cord. Ive loved this lamp since I first saw it at Rooms to Go. My niece also fell in love with it. I just saw it at Havertys for $249. It's really beautiful. I'll prob get another when I'm able to. 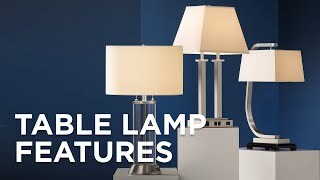 I chose to order two of these lamps for the nightstands in our master bedroom. Exactly the look I'm going for and the price was fantastic! Goes with 2 other lamps in my sunroom! Where is the cord on this lamp? Does it run from the base or up high where the on/off switch is? BEST ANSWER: It comes down the tubing in the middle. It has a silver colored cord. The on and off switch is a turning not left to right but easy not like some. It runs from the top down the center in a cylinder. It runs from the base, like a normal lamp. We recently moved and the movers lost my bedside lamps....the shade is like this one. 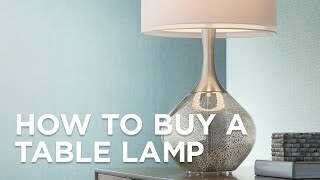 Is it possible to purchase the lamp without the shade since I already have it? BEST ANSWER: I am sorry, the lamp base is already priced to include the lamp shade. The base is not sold separately. Hi, I am interested in this item but I prefer to have it in black shade. Would that be possible since like to purchase this item? Thank you. BEST ANSWER: Hi, unfortunately this table lamp is not offered with a black shade. Below is a link to our black shade collection that we offer. 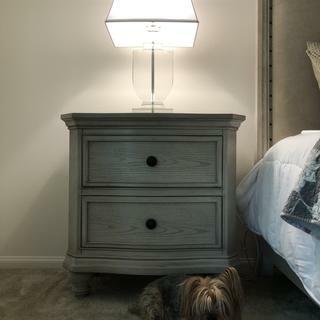 Is this lamp the correct height for a dresser that is 36.50 in height? 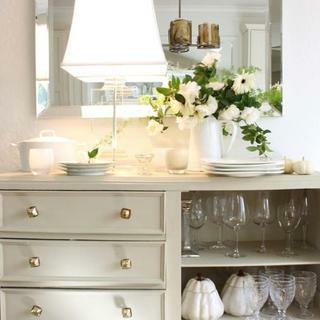 BEST ANSWER: Dresser lamps depend upon the height of the dresser. 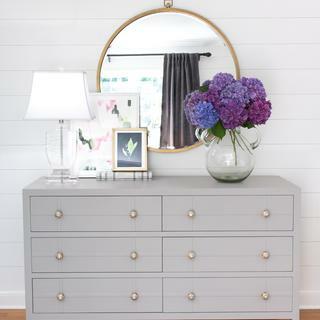 If the dresser is over 40 inches tall, select a 24-inch lamp or shorter. 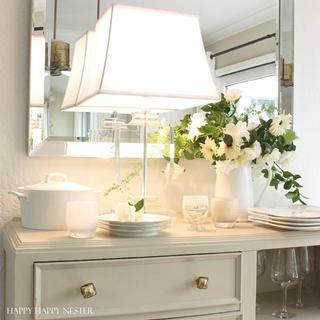 If the dresser is 30 inches tall, the lamp should be approximately 32 inches in height. In your case, with a height of 36.5 inches for the dresser, this lamp at 26.5nches in height should be perfect! 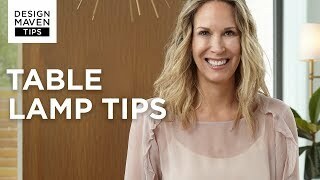 You want the overall height of the lamp including the dresser to be about the height of a floor lamp (60-65 inches). Also, consider the scale of the dresser as well as the artwork, ceiling height, etc. when selecting lamps. What are the measurements of the base and the widest point of the base top? BEST ANSWER: The base footprint measures 7" wide by 4 3/8" deep by 1 7/8" high. The widest point of the base measures 7 1/8" wide. Is the wiring in a tube in the center or expised on outside hanging free? BEST ANSWER: The wiring-cord runs through the center of the lamp in a tube, exiting at the bottom of the lamp body. Are the balls on bottom of base crystal or metal ? We hope you like the photos styled by @HappyHappyNester - look for more exciting images and video on our product pages! We hope you like the photos styled by @mytexashouse - look for more exciting images and video on our product pages! Great quality, great looking, great value. Good condition. On time . Free shipping a big plus. Went on sale right after I bought them. It burns a bit. We hope you like the photos styled by @drivenbydecor - look for more exciting images and video on our product pages! Product arrived quickly and in perfect condition. Perfect lamp at a really good price. Delivery on schedule. Packing well done. Everything you see and MORE! Very classy lamp for the nightstands in our bedroom - We couldn’t be happier with their quality. I am very impressed with the quality of this lamp and shade; it looks more expensive than $150. Is lovely when "on" and is heavy so no need to worry about tipping. Well packed. This is a beautiful lamp. 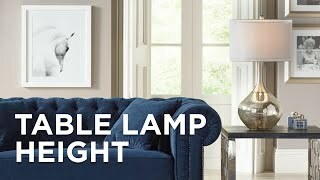 I saw a variation of the same lamp at Havertys, but this one is cheaper (almost $100 cheaper) and heavier. My husband loves it also. Now were are trying to determine if we want to leave it in the guest bedroom; or place it in the living room. You can't go wrong with this one. Just what th decorator ordered. I had seen this lamp at a place and just thought, I like! So went about town saw it in a store here, $500, uh no. Went on line and found it here, half the price if not less. I purchased two. Also purchased a different shade, black. As I said, just what the decorator ordered. Gorgeous. Wanted something airy. It’s perfect. 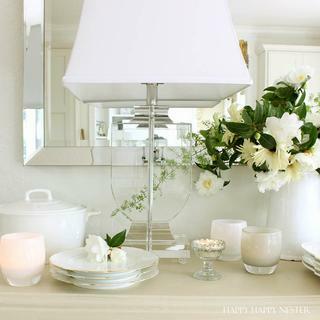 I adore my crystal lamp and looks beautiful and makes a statement on my counter.